Jamie and Susannah are a team forged through their shared passion for the environment, adventure and a love for life, both traveling the world their paths crossed in the Caribbean and they have been inseparable ever since. As a couple, they set their sights on the charter industry from the word go and their accomplishments are a testament to their abilities. Their unmistakable passion for what they do creates an unforgettable experience where an atmosphere of safety and professionalism allows their guests to immerse themselves in the care free and fun loving Caribbean vibe they themselves fell in love with. They thrive on creating an environment where no task seems to be a chore, no effort to great in the search of creating the perfect experience for their guests. Captain Jamie grew up on the shores of South Africa. His parents being avid SCUBA divers, he was taught from an early age to understand the ocean and all that goes on above and below its surface, to protect it, to love it and most of all, to respect it. Growing up the Indian Ocean was his natural playground and at a young age he was already an accomplished surfer, free diver and spear fisherman he became a qualified SCUBA diver at the age of 12 and spent much of his free time in his early teens racing 30ft monohulls up and down the coast. The ocean became a way of life and from a young age Jamie knew the sea would forever be his home. He began his professional life as a SCUBA instructor at the age of 18, working for a company specializing in the conservation and research of aquatic life. He then used his natural affinity to share his love and knowledge of the underwater world to travel the eastern coast of Africa from the vast shores of south Africa, up through Mozambique, into Tanzania and Zanzibar. All the while honing his skills captaining dive boats and sailing yachts in some of the most challenging environments on earth. His adventures ultimately landed him in the British Virgin Islands in 2013, working initially for shore based companies he ran SCUBA diving excursions throughout the BVI as well as working for a commercial diving operation specializing in yacht maintenance, repair and salvage. No longer able to be confined to land he joined a dive live aboard as a dive instructor but his knowledge and natural ability saw him promoted through the ranks of engineer and up to Captain of the 105ft vessel all in the space of a year. Mentored by a true legend in the BVI charter industry Jamie was gifted with knowledge of the area that took his employer forty years to accumulate, combined with years of experience in the area, you can safely say Jamie is an expert on the area and can truly show you “Natures Little Secrets”. Chef Susannah hails from Northern Ireland but is no stranger to the water, with her family being very active members of the Royal Yacht Club, she was taught to sail on Lasers from a young age in waters where the consequences of a mistake could mean a dunk in the Atlantics dangerously could waters. She was also taught to handle the large rescue Ribs and was present on many safety and rescue operations coordinated by her father. Her thirst for adventure soon had her traveling the world, visiting countries such as Australia, New Zealand, Fiji, Thailand, Vietnam and the list goes on. Her travels and her outgoing nature has allowed her to immerse herself in a variety of cultures which ignited her passion for people and of course food. Drawn to the water she was soon a qualified diver and keen surfer. Her travels brought her to the BVI in 2015 and she fell in love with the Caribbean way of life. The beauty of the Virgin Islands combined with the endless possibilities for adventure and exploration both above and below the water meant she knew she had found a place she could call home. After many months working as a stewardess Susannah found the galley calling her name and so her professional culinary journey began. Not one to do things halfheartedly Susannah went on to complete not one but two professional chef courses. Under the guidance of many excellent teachers at Ashburtons Chef Academy (Devon, England) she completed the level 2 course in culinary skills and food safety in catering. Just a few months later motivated and ready to learn more she attended the prestigious Ballymaloe cookery school (Co.Cork Ireland) and graduated from their intensive 3 month course. Susannah’s cooking reflects seasonal local produce and contemporary plating whilst always considering guests preferences. Thank you again for another amazing vacation aboard Island Hoppin’! As Island Hoppin’s first repeat customer, we weren’t sure if the second time could be as amazing as the first visit we had with Jamie and Susannah in 2018 but we had an over the top week! For all those wondering if they should do a repeat trip, get on it and book now!! This trip was even better than last year’s. All of our adventures were new and unchartered territory. There were so many new, fun experiences in different places, and the “Hotdog” was the perfect addition for lots of laughs. The boat was in tip, top shape and looked just as great as it did last year. Susannah wowed us with terrific new recipes for all meals; Jamie amazed us with amazing new dive sites. Jamie & Susannah, and Island Hoppin’ are a wonderful combination; their care, attentiveness, professionalism, demeanor, and great personalities, together with a beautiful boat, left us with terrific memories and we are ready for the three-peat. Jamie and Susannah met us when we arrived and quickly rolled all our bags down to the boat. They were friendly and professional all the while getting us quickly onboard after snapping the first of many pictures for us. They looked sharp as did Island Hoppin'. We were shown to our cabin and told to settle a bit and come up for safety information before we set off. Everything was done to make us feel us welcomed. It was a perfect beginning to a wonderful week long charter. The crew went out of their way to find extra large size 14 fins for one guest. They also gave instruction and encouragement on the use of all equipment. The boat was very comfortable and we loved all the spaces to sun, read, dine or watch Jamie raise the sails. We're sailors so it was fascinating to view all the high tech equipment used for navigation and operating the sails. We had expressed a desire to sail as much as possible and Jamie was as happy as we were to watch the sails fill and the boat respond . There is nothing like the sounds and sights of sailing. Jamie was the perfect combination of professional captain and fun ship mate. We felt like friends all enjoying the same adventure. When time came for getting underway both Susannah and Jamie worked to secure the boat, pull the anchor and set the sails. They did all this easily and without any confusion. They made it look easy . They are fit, capable and knowledgeable. Jamie not only answered every sailing question he gave the guys a tour of the engine room too. They were fascinated by all the operating systems and Jamie gave them a great "tour." I have some funny pictures of Jamie standing in the opening and the men looking down into the compartment. We were pleased that our preferences were taken into consideration. Susannah prepared fresh fruit for our breakfast that was sweet and arranged on tray. There was always plenty served and the quality was outstanding. Crisp greens were used for our lunch salads and the dressings were all homemade. Susannah uses ingredients to create some of the best salads we've ever enjoyed. We encoured Sue to write up her recipes so we could attempt to recreate them. We had fish served with salsa's and sauces that were tasty and attractive. Jamie grilled delicious, tender chicken and beef which Susannah served up with roasted vegetables. Each dinner was served by Jamie who would explain what Susannah had created. When we had questions on ingredients Susannah would come out and give us the details on how she'd created our meal. I can't say enough about the quality of our meals. The desserts were amazing. Susannah surprised us with delicous desserts too. Each dinner ended with a sweet indulgence. I think my favorite was the Lemon Souffle served with raspberries. Chocolate brownie with a side of ice cream was Bill's favortie. All desserts were beautifully served too. The attention to detail of each meal served was outstanding. Susannah is an outstanding and competent chef, The food exceeded our expectations. We also were pleased that they prepared our food without excess salt and made sure we had no shellfish on the boat due to one passengers allergy. We have given a lot of thought and can't think of anything that wasn't addressed before we began our charter. The material and suggestions provided answered all our questions. What really helped us was the Facebook Island Hoppin' message board where we could ask Jamie and Susannah questions. They would answer quickly and it felt like we knew them before we even met. They were funny, helpful, and welcoming. 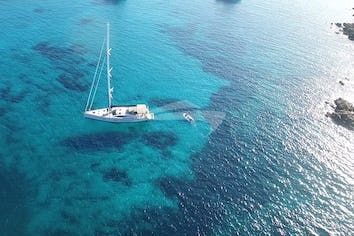 All concerns were addressed so we felt completely relaxed and confident that we were going to enjoy an amazing charter. I'd direct future guests to use and view this media. It really gives you a clear picture of the boat, the crew and what to expect. When our cab which by the way Jamie arranged arrived at the marina we right away recognized Susannah and Jamie. We felt like we were meeting two friends as well as our crew. In January of 2018, we finally went on our first sailboat charter ever in BVI and it couldn’t have been better! 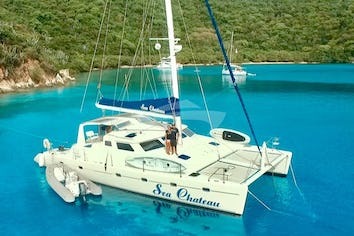 It started in St. Thomas when we were escorted to a beautiful brand new 52 foot Lagoon catamaran aptly named Island Hoppin. We were greeted with champagne by the awesome and darling crew Jamie and Susannah! We then toured the yacht and it was much roomier than I expected and our stateroom (and all the others) was absolutely beautiful with an on-suite bath and large window. The bed and bedding was so comfortable. The entire yacht is so well designed and spacious, there were 3 couples and we had more than enough room to lounge about all over the boat. We can’t say enough about the crew. Jamie was our Captain and host and Susannah our Chef. They are both so knowledgeable, not to mention fun to visit with, and respectful. Jamie was great getting us out on the water using all of the fun toys, we joked that it was our Senior citizen (we aren’t that old) play day! Jamie knew just how to manage us and help us with instruction on how to use the wide assortment of water toys, anything you could hope for. Jamie is clearly a seasoned Captain. It was our first time on a large sailboat and it was awesome watching the sails go up. The bow has a really nice sitting area and the helm area was very large, so we could spread out up there where the views were spectacular as we watched Jamie maneuver the sails through the beautiful islands. Susannah went snorkeling with the ladies a couple of times and pointed out all the wonderful sea life. Susannah prepared the most beautiful and delicious meals that were served at the lovely outside dining table which we really enjoyed. Everything was so tasty I was amazed, and it was fun to watch her in action, she is such a gourmet chef! There is a great tender on the boat. It goes fast, so Jamie would use to pull us around on the tube and take us to various islands and drop us off to snorkel or tour. We were sad to say goodbye to Jamie and Susannah when our 10 glorious days were over. Hopefully we will see them again soon on our next trip! Absolutely AMAZING vacation that exceeded our expectations in every way! No shoes. No makeup. No phone. No schedule. Just family, friends, fabulous food, cold drinks and sunsets. Every day was a new adventure! We arose to the smell of freshly brewed coffee that we enjoyed while Susannah prepared a delicious breakfast. We watched our children have the best vacation ever—paddleboarding, kayaking, hiking, snorkeling, cliff jumping, rock climbing, island hopping---and we joined in with every activity. Even our teenagers enjoyed the slow pace of afternoons when we would relax, horizon watch, sail and do nothing while just enjoying the amazing views. Ellen---once again---selected the perfect crew for our family! Jamie and Susannah made us feel truly at home and embraced our active crowd. They had lots of energy to keep up with us, were full of information to teach us about sailing and the islands, and made each day humorous and fun! Drinks were unique and bottomless, the meals were expertly prepared and we are already counting the days to return to the best vacation ever! We spent 10 days on Island Hoppin with Jamie and Susannah in January 2018. Wow. 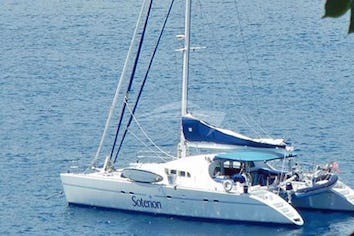 This was our 4th crewed charter and we have done 3 bareboat charters as well. This trip ranked far above the other trips.The boat is a brand new 2018 Lagoon. It has some really smart designs re: space - it feels much larger than a 52 foot. We were on a 54 foot Nautitech a couple of years ago and this boat felt so much more spacious with many additional areas on which we could spread out and relax. The boat was loaded with all the toys one can think of. It had a giant lilly pad, scuba gear, kayaks, stand up paddle boards, and probably a few others we did not pull out. One day we simply found a calm day on a calm bay and simply played with the toys all day.The crew is amazing. They are attentive yet give you space. They seemed to read our minds and knew when to get us in the water and playing vs when it was time for an awesome signature cocktail. They introduced us to new spots in the islands, and they were a lot of fun at the same time. Jamie has unlimited patience with guests who are trying to learn new skills on the toys or the boat itself. Susannah's food and presentation were simply spectacular. Between my wife and I, we put on 15 pounds! The islands are recovering nicely from the storms. They were nice and green. The beaches were beautiful as always. The water was crystal clear for snorkeling and playing on the toys. The people are even more awesome than before and are excited to see visitors come back to the islands and support their recovery efforts. Here and there one will see some areas that are still damaged, but they have come a very long way!And... the best testimony one can give - we are planning our next trip on this boat with this crew!